You know what’s tougher than the VA? I simply refuse to believe that we could force our minds and bodies to do the things we did in military service, but we cannot get our claim granted the way we believe it should be. Crawl through the mud under fire to find a better fire position? You can beat the VA.
Jump out of an airplane and have your parachute collapse? You can beat the VA.
Survive 2 years of 120 degree days and 80 degree nights in Iraq, living under constant threat of mortar attacks? You can beat the VA. I do believe, however, that we must approach our VA Disability claim with the same discipline, the same grit, and the same professionalism as we approached everything in our military career. I Have Found 8 distinct patterns in VA Disability Claims. I have been representing Veterans in the VA Disability Claims process for 8 years. During that time, I have looked at hundreds, if not thousands, of VA C-Files. And while looking through those C-Files, I began to notice patterns. Patterns why the VA acted in certain ways. Patterns of filings by Veterans. Patterns of evidence in certain types of claims. I found 8 patterns that were so common, that it was hard to ignore their impact on a VA claim’s outcome or timeline. I realized that the Veterans that did MORE of these 8 things had completely different experiences with the VA disability claims process. A large percentage of people that followed the 8 patterns – what I call the 8 Steps – had very different outcomes and timelines in their VA disability claims and appeals. I tested the 8 Patterns in my Firm’s VA Disability Claims. The VA still took a long time. But instead of taking 3 years for the VA to get a decision, we received many decisions in under a year. In a few cases, we received decisions in under 90 days. The VBA still made a lot of mistakes in the VA disability claims. But the VA errors were fewer and smaller. The results were shocking enough that I decided to share my experience with Veterans like you on the Veterans Law Blog. Here are the 8 Steps YOU can Take to Improve Your VA Claim. Step #1: The Veteran has to “See the Solution”. The VA may be the problem. But Congress isn’t the solution. The VA isn’t the solution. YOU are the solution. When you realize that you have MORE Power in Your VA Claim than you think you do, you have taken the 1st step in improving your VA Disability Claim. Start this Step by reading about the “5 Reasons that the VA Keeps Screwing Up Your VA Disability Claim”. Step #2: Get your VA C-File. 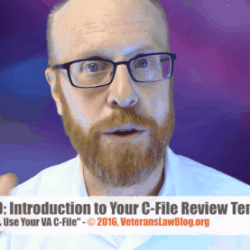 The C-File is the most important document in your entire VA Disability Claim. Often times, the reason that the VA is denying your disability claim is in your C-File. Get your VA C-File NOW – don’t wait another day. 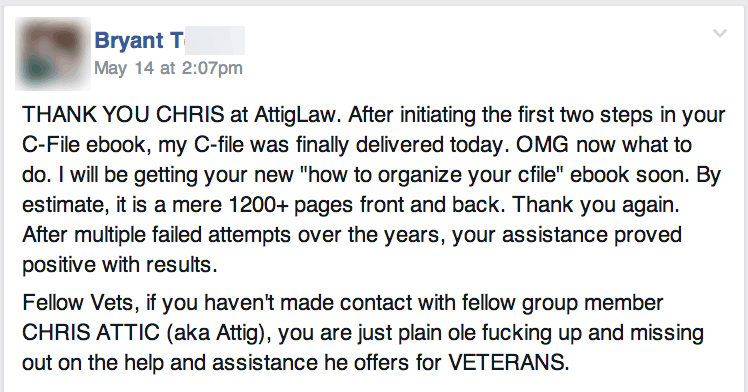 Follow this link to find out the method my firm uses to get Veteran’s C-Files from the VA. Step #3: Learn the Law. You don’t need to become a lawyer. But you do need to understand some of the basic law of a VA Disability Claim or Appeal. There are 10 Cases that I think Every Veteran Should Know – I teach you how to USE the law in these cases to help your VA disability claim. If you have a TDIU claim – understanding how the VA looks at evidence and arguments in these claims can change how the VA treats your claim. Step #4: Build the 4 Pillars. 4 Pillars need to be built in nearly every VA disability claim for service connection. The 4 Pillars are: Eligibility, Service Connection, Impairment Rating, and Effective Date. The most important pillar is Service Connection. The pattern that I saw most frequently in failed VA disability claims was that the Veteran did not know the 4 Pillars of a VA claim, or the 5 Ways to Service connect a disease, disability or injury. Far too many Veterans either made the VA look for the needle in the haystack, or relied on just 1 of the legal theories of service-connection. 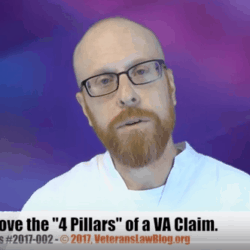 You can learn everything you need to know about proving VA Service Connection and the 4 Pillars of a VA claim in my 5 hour webinar. Don’t worry, it’s recorded, and broken down into bite-sized chapters so you don’t have to watch it all at once and can come back to it any time you want. Click here to get your copy today. Step #5: Use 5-Star Evidence. Next to not getting a C-File, using bad evidence or the wrong evidence is the single worst thing you can do in your VA Disability Claim. Most Veterans that had problems with the VA treated evidence like this: they hid the evidence in a haystack, and then griped at the VA for not finding the needle. I believe that to successfully prove your claim, you will need to learn – and use – 5 Star Evidence. Veterans need 2 types of evidence to prevail: Lay Evidence and Medical Evidence. Lay Evidence is the Bullet, and Medical Evidence is the Rifle. And my Veterans Law eBook VA Claims Evidence Field Manual (The Secret to Proving Your VA Disability Claim) will teach you the basics of using both. Step #6: Choose the Battlefield. Many Veterans think of the VA Claims Process as a “Hamster Wheel” – and endless circle of claims, denials, and remands that never really gets them anywhere. In this eBook, I try to explain how the process is better thought of as a ladder. When we better understand the VA Claims Process, we can choose our Battlefield. Certain battles – like effective dates and many impairment rating issues – cannot be easily won at the VA Regional Office. They are often more easily won at the BVA. Other battles need to be fought at the Veterans Court. By understanding the VA Claims Process better, we can choose to stop fighting the wrong level of the VA, and push our claim into the forum where it is most likely to get granted. Step #7: Protect Survivors & Dependents. 1 out of 3 cases that my Firm handles are for the surviving spouses of Veterans that died while their claim was pending at the VA. There are some things that Veterans need to do – NOW – to protect their surviving spouses and dependents in the event that they die while their VA disability Claim is pending. Preparing your claim for your survivor’s DIC claim, or Accrued Benefits claim, is something that you can start doing now…believe me, it will make it much easier for your surviving spouse to recover Dependency and Indemnity Compensation or Accrued Benefits if the VA does not grant your claim before you pass away. Step 8: Choose Your Representative Wisely. Not everyone likes to change their own oil. And for some folks, removing and cleaning the carburetor on a motorcycle is an impossible task. Check out over 700 posts here on the Veterans Law Blog, where I post every weekday on VA disability claims topics. I’ve written over 10 Veterans Law eBooks (I call them Field Manuals) that go into much more depth than even the lengthy posts on the Veterans Law Blog. Click here to check out all the Field Manuals – including those that are about to be published. From attorneys that are accredited to represent Veterans in their VA Disability Claims. 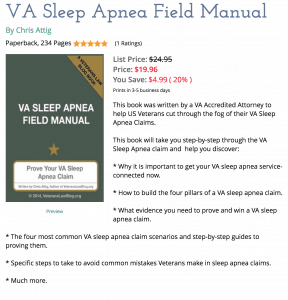 (Here is a FREE eBook to help you figure out how to find and choose the attorney that is best for you in your VA Claim or Appeal. 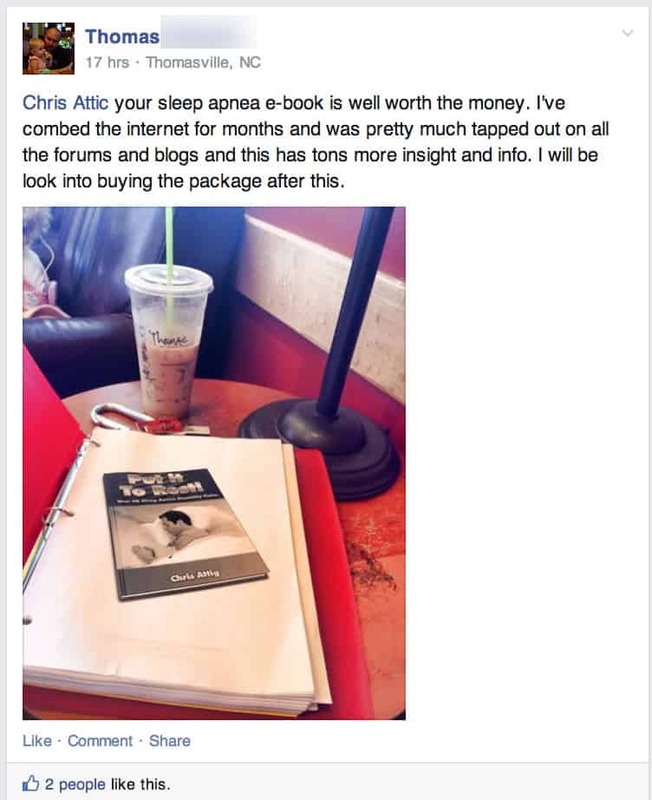 I have to tell you – no blog, no Veterans message board, no Facebook group of Veterans, and no Veterans Law eBook can take the place of good legal advice from an accredited VA attorney. The information I provide on this site in the Veterans Law Blog and Veterans Law eBooks are meant to be general guidance and education – not legal advice. Legal advice will be narrowly tailored to the specifics of YOUR VA Disability claim. These eBooks are general in nature – and designed to increase your education about, and understanding of, the VA Disability Claims process. If you trust the VA, they are very fond of telling Veterans that they don’t need to hire an attorney – and I’m not telling you that you do. But when you get in over your head, Get Help. Just make sure you get help from someone that knows what they are doing. Watch your back when it comes to VSOs – read about how the VFW literally betrayed a Veteran they represented. Read about a VSO that doesn’t know the timelines in the VA Claims Process. And watch your back with VSOs. “I am a Vietnam war combat vet. This Guidebook shows veterans how to cut through the stalling and lies from the VA and force them to tell you the truth. As a disgruntled combat vet, I give this FIVE STARS and a thank you to the author. If the book contained nothing more than a … template … to get your VA records, it would be worth much, much more than it sells for. “I didn’t realize how important lay evidence was. Great job highlighting the common mistakes, too. I have an insight now that I did not have until I found your website and the eBooks. It would be nice that if veterans like myself who are living on the edge financially didn’t have to PAY to get good advice to help us. Ya’ know?? I busted my gluteus maximus for 2 1/2 years in SEA, and now I have to pay for help? I guess you’re more into this for the money than to help the veterans. I feel your pain – when I first got off active duty, I was dirt poor, and came damn close to living under a bridge. And I was an officer with a college degree….should have been easy for me to get a job, right? 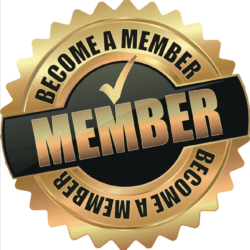 The simple fact of the matter is that this blog is big enough that it costs a lot of money to keep going – and to keep pushing towards my goal – an organization that files Vet’s claims, the right way, the first time, at no cost. Ya’ know, what the VSOs are supposed to be doing. Every dollar of revenue goes back into this blog, improving it, creating MORE information and books, and hopefully soon, adding staff to help us help more of you. I am trying to find Corporate Sponsors for the Veterans Law Blog – companies that are willing to contribute to make the blog free, for everyone, for a week/month/etc. Thanks for sharing your VA Claims experience!! I can think of only 1 time that I’ve told someone they didn’t have a claim – and it was because it involved aluminum foil, microwaves, and bologna. In all seriousness, most Veterans have legitimate claims …. they just need the information and power to push their claim through the VA Hamster Wheel.